After payment you receive a link on which you can get a license key with the game Day of Infamy from the official supplier - the company "Buka". Release date: March 23, 2017. 19/05 - Great Australian update! It includes a new map, new detachments, including Australians from the Australian Imperial forces, new weapons, achievements and much more! 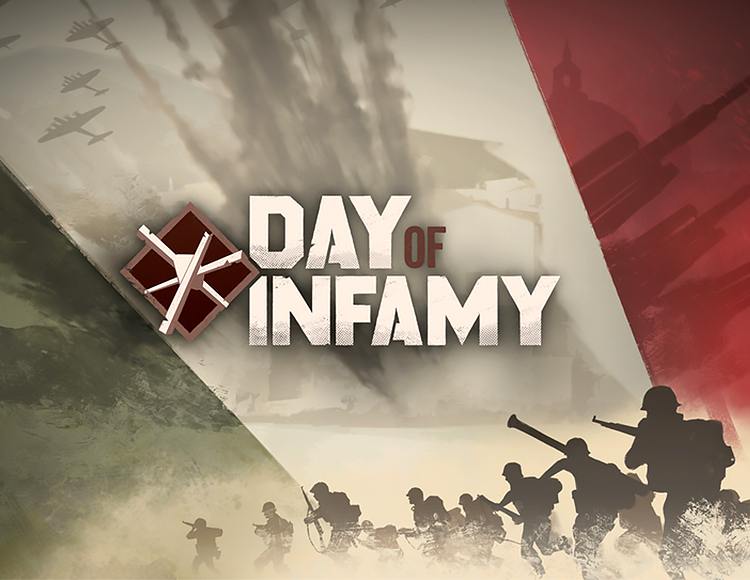 From the trenches dug up to the streets destroyed by the explosions, Day of Infamy is the fierce infantry battles of the Second World War. Taking its start as a modification for the game Insurgency, Day of Infamy gradually developed into an independent game. The intense combat mechanics and simplified game interface create a sense of presence and full immersion in the game. The tasks are closely related to the emergence of new waves of enemies, thanks to which the game component is made on the team coordination of actions. The control system of the detachment relies on the role classes of players, depending on which team you are in. Also, having a certain number of tokens, you can change and improve the equipment, which in turn affects your appearance, weight, endurance and speed of movement. During the battle, officers have the ability to control their own unit. In addition to the variety of orders, there is the possibility of shelling an enemy with artillery fire, provided that a radio operator is nearby. To communicate with your peers, use a local VOIP connection, but keep in mind: if you approach the enemy too closely, he will hear you. In addition, radio operators play the role of "connecting beacons", giving players the opportunity to listen to negotiations between other radio operators and headquarters. We tried to recreate the strict gemmley of another game about World War II, Day of Defeat, that saw the light in 2001 as a modification for Half-Life. It is the nostalgic atmosphere of this classic game that serves as the basis for Day of Infamy and is successfully complemented by modern intuitive and intense mechanics of fights. Continuous infantry fighting, in which up to 32 players can participate simultaneously, performing tasks to control the terrain or destroy objects. Detachments of 8 players battle against uncompromising AI in attack or defense mode. The infantry forces of the British Commonwealth, together with the US troops, are opposed to the German Wehrmacht. The game component for the allied factions allows the British and Americans to fight side by side. From the shores of Sicily and the streets of Italy, to the forests of Belgium and Germany. And, of course, the coast of Normandy. A wide arsenal consisting of rifles, pistols, revolvers, machine guns, machine guns, grenades and flamethrowers. You can equip weapons with bayonets, increase the capacity of shops or replace the mechanical sights, respectively, until the historical period. Day of Infamy was the most popular modification for Insurgency, it was downloaded by more than 175,000 users. Thanks to the introduction of support for the Steam workshop, capable members of our community can create their own modifications: weapons, clothing, maps and the like.